Work challenges can be overcome with plenty of discipline, prayer, and preparation based on determining what your personal and career-oriented priorities are. 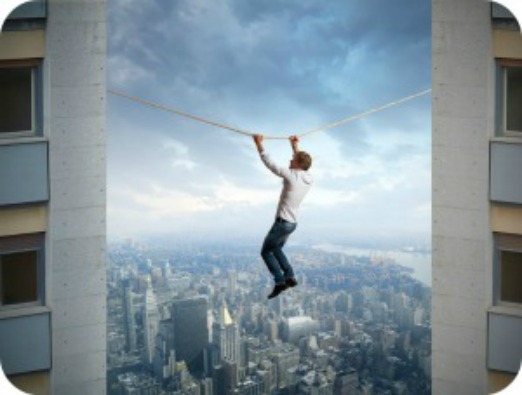 Do you feel as though you are walking on a tightrope or a fine line at your job sometimes, perhaps finding yourself taking unnecessary chances or risks you are not willing to take, especially if you are asked to say or do something that is contrary to what God would want of you, which may in turn, affect your Christian testimony? Transportation Problems: This can be a huge stress! Unless you have a car to get you to your job, or live in a big city where there are always subways and buses, it can pose a big problem for you or your family. You may need to set up some kind of arrangement with other family, friends, or co-workers to take you back and forth. I remember years ago my dad had to drive nearly 12 miles back and forth to work everyday; however, one day his car broke down in the worse kind of way and needed to be replaced. Until he could buy a newer car, he ended up paying a co-worker to take him back and forth for many months to his jobplace. There were also times in which he bartered various things like food, or home supplies with other friends and family members to help him along until his transportation situation got better. Problems/Crises at Home: Of course whatever affects your home life will surely affect other areas, including your employment or career. You may need to seek the help and advice of your pastor or other Christian counselor when it comes to family matters. Whatever they are, it is best first to take them to the Lord and lay them at His feet in fervent prayer and meditation on His Word. Here are a few passages of scripture to consider: Psalm 105:4 says, "Seek the Lord, and His strength: seek His face evermore." Isaiah 55:6-7 says, "Seek ye the Lord while He may be found, call ye upon Him while He is near: Let the wicked forsake his way, and the unrighteous man his thoughts: and let him return unto the Lord, and He will have mercy upon him; and to our God, for He will abundantly pardon." Matthew 7:7 tells us, "Ask, and it shall be given you; seek, and ye shall find; knock, and it shall be opened unto you..." And, Psalm 34:4 encourages us, "I sought the Lord, and He heard me, and delivered me from all my fears." I can honestly say that these few verses have helped me whenever I've had problems and obstacles at home. Anxiety and Depression: Many people take pills to calm their anxieties or fears and some even seek medical help for these ailments because of pressures or compromises from the job, or when there are hard challenges from the boss or other co-workers to do something that goes completely against your Christian values and against your own conscience. It is so important to spiritually discern various situations that create these problems for you, and to decide what you must do to right them. If there is sin in your life resulting from your work environment, then you absolutely must get it right with God. Then and only then can you have peace with doing the right thing, and with your fellow man. Realize You Are In The Wrong Line Of Work: Maybe through all the various struggles, obstacles, or challenges you are facing within your employment, it may dawn on you that this is not what you signed up for as a career or as something you want to continue for the long haul. Look to see what other options are out there before making a final leap out of your current position. You may want to talk things over with your family members or other friends to get their input on what you should do. Ask the Lord to help you through the process of looking for different employment. There is always a way out when you feel deeply concerned that the current situation at your job is too overwhelming and difficult to continue in. It is true that many problems you have in life, including those from your employment, resolve themselves over time, but those that do not will need to be addressed before they become too overwhelming for you. Pray to the Lord for more strength, guidance, and above all, more grace to face whatever challenges come your way in the workplace. This one thing has helped me throughout many storms and God knows all that is going on in various job situations. Ask for help from those (family, friends, pastors, church members, your boss, or other co-workers) who may have the resources (time, energy, money, or the knowledge pertinent to your situation). Don't feel ashamed or proud about asking for help. Many times God will place those certain people directly in our paths to aid and bless us when we are in need. Be strong in your faith. When you are in the Word and praying daily and continually, with full trust and confidence that God will see you through whatever the situation or crisis, you can overcome anything! Philippians 4:13 reminds us, "I can do all things through Christ which strengtheneth me." James shows us how we grow and develop spiritually when our faith is being tested: James 1:3-8 says, "Knowing this, that the trying of your faith worketh patience. But let patience have her perfect work, that ye may be perfect and entire, wanting nothing. If any of you lack wisdom, let him ask of God, that giveth to all men liberally, and upbraideth not; and it shall be given him. But let him ask in faith, nothing wavering. For he that wavereth is like a wave of the sea driven with the wind and tossed.For let not that man think that he shall receive anything of the Lord. A double-minded man is unstable in all his ways." And then there's Hebrews 11:6 which reminds us, "But without faith it is impossible to please Him: for he that cometh to God must believe that He is, and that He is a rewarder of them that diligently seek Him." Remember Who owns you and Whose voice you listen to. Just knowing this truth keeps me on target and the right track during those times when I have fears or doubts about my work or career path. As a believer and a child of God you will always want to heed the Holy Spirit's leading in all things, including your job and career. You are His, and His alone. I just want to encourage you to keep pressing on and moving forward as you are not only doing a job for yourself and your family, but are doing so for the Most High God. Who could be a better employer than He? No one because His plan is far better than anything you or I could ever drum up for ourselves in life. Proverbs 16:9 keeps us in check here as it says, "A man's heart deviseth his way: but the Lord directeth his steps." To me, that's takes a bit of the pressure off from me and places it on the Lord. He knows what is right for me just as He does for you. And finally, I want to remind you of how God's continual goodness will keep you going all the day long as you go about various obstacles and challenges at work, and that He really does have a plan for you here on earth. He will also aid you in being successful in that plan. I love this passage of scripture that makes His intentions towards us very clear, just as He made them towards the Israelites so many years ago. Jeremiah 29:11-14 so eloquently states it, " For I know the thoughts that I think toward you, saith the Lord, thoughts of peace, and not of evil, to give you an expected end. Then shall ye call upon Me, and ye shall go and pray unto Me, and I will hearken unto you. And ye shall seek Me, and find Me, when ye shall search for Me with all your heart. And I will be found of you, saith the Lord, and I will turn away your captivity, and I will gather you from all the nations, and from all the places where I have driven you, saith the Lord; and I will bring you again into the place whence I caused you to be carried away captive." I encourage you to allow your work to be a shining example and demonstration of your purpose in life and of your love for God, so that others will see His light through you as you serve Him faithfully and endlessly. God Bless.